Grevillea oldei is a small, open shrub with arching branches and may reach a height of one metre. The leaves are narrowly ovate to almost triangular with a sharp point. Bright red flowers are carried in pendulous, terminal globular clusters. Flowering occurs in winter and summer. The blooms are rich in nectar and attract honeyeaters. Grevillea oldei is considered to be rare but not threatened. The species was growing at Melbourne Botanic Gardens in 1909 and has been successfully grown in Sydney. 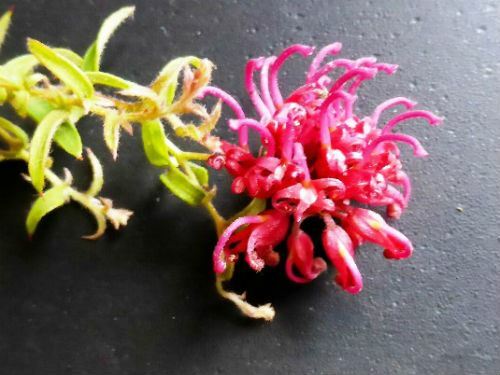 Grevillea oldei is found in the Gosford area, north of Sydney. Strickland State Forest is a stronghold of this species. In parts of the forest Grevillea oldei is the dominant understorey shrub. Grevillea oldei prefers well-drained situations in full sun or partial shade. Prune lightly after flowering. The species is named after Peter Olde, the co-author of the magnificent three volume Grevillea books and the leader of the Grevillea Study Group. The type specimen was collected along the Dog Trap Road, near Ourimbah on the Central Coast of NSW. This road is close to Strickland State Forest.